Already a reality around us that life is not taboo, there are people living with abundant paced and there are people whose lives panting. Everyone (I believe) really wants his life should not destitute but that can be difficult to be all-sufficient. But if you want only limited self-sufficient so people without doing anything to achieve that desire, then you will be branded a hangover and more severe concussion. My advice, much better you sleep and hope to have a dream to be rich, although ultimately not as good as when you wake up in the dream story and found only a pile of dung eye in the corner of the eye. Back again, living with less excess material not only owned 10 percent of the people on earth, the remaining 90 per cent of people live completely mediocre even destitute. The question is ..
How to be in the top 10 percent of the rich man? It turned out to be rich, you just need a bit of discipline in managing the finances that you have today.Whatever the job, and financial resources do you have that's not a problem, but the important thing is how to manage the money you earn it. Striking differences are often found when conducting a survey on a group of poor people is how to manage their money that is fairly simple and far away from thinking touch economic principles. Poor people are always inclined to spend the money they get for consumption, so that today earn 50,000 so the money will disappear the same day for consumer spending. Matter what to eat tomorrow, I'll just think about tomorrow. Exactly the same as the life of a chicken, corn-fed segengam, 5 minutes later you will no longer find a penny seed corn. What about the financial management of the middle class? This group manages their finances, semi-emergency. Meaning? because normally these groups are professionals who earn more, then they implement financial management follow the lifestyle. But if on the chance to meet with friends who have a lifestyle then they will invest bandwagon and quickly affected. In a book I have ever read, that written of Dan Benson "12 stupid mistakes that people make with their money", mentioned there were 12 serious mistakes that many people do with their money. Any 12 fault is it? #1.Relying on "One Day" Misleading. #2.Awaiting Rainy Day Before Aware That You Do not Have Umbrella. If we remember the story of Noah who built an ark in the desert, and it was no longer the rainy season, then this is a good lesson to be learned. The point is do not wait state later you have your new great urgency to do, this is a mistake. #4You Are What You Drive. It was said about the debt just belong to the middle class and poor, and only the rich people who like to give debt. Currently in line with the progress of the banking world, the products offered to the community was so diverse, one of which is a credit card. It's her way of debt of the most subtle, with the lure of low interest and can be repaid will make people drool. Worse yet there are people who to have two types of credit cards at different bank. #6.Ignoring the relationship of money and the body. I rarely find people so concerned with their health, usually later ill health would think about how I'll recover quickly. This is a mistake, stupid to be avoided, so you need to do on a regular basis such as conduct general health checkups regularly, take vitamins and herbal medicines, always the consumption of organic food. #7.Failed to Utilize your Mighty Four Friends. According to Robert Stevenson A friend is a gift you give to yourself. So a friend is actually an asset that can be invited to cooperate to print revenue. The facts say otherwise, friends cuman used as a place to vent it all out. These seven errors that can not be denied many people do. Investment is not about numbers, how much you are able to deliver but do not you dare make investment decisions when everything is difficult. Stupid mistake to eight is that you do not quite have the courage to undertake an investment and have always been pleased with the comfort zone when you feel heavy enough to pass. Many companies out there that offer them all kinds of insurance, but whether it is insurance that really you need? 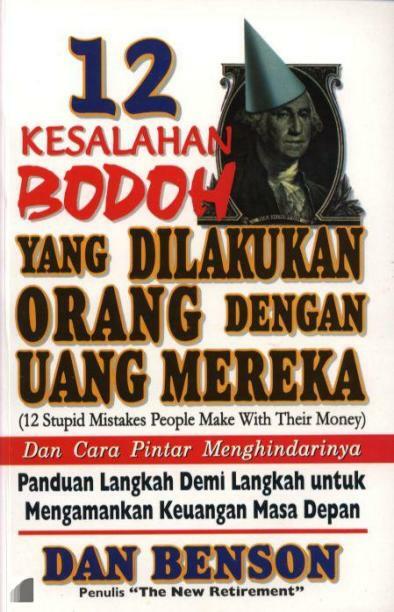 Ninth stupid mistake, you sometimes get stuck menngikuti an insurance program that actually you do not need. An example is the life insurance of children, when you are a civil servant who had been given health facilities through BPJS. #10.Teach the stupid mistake in the next generation. Parents work for her, it's true but it does not mean all the wishes of children. If you do, then you have made a stupid mistake to ten. Expecting a windfall from the legacy of their parents, it is okay as long as it is true there that can be shared. But if the inheritance is relied upon family finances, you have made a stupid mistake to eleven. Parents hope to die in order to get the inheritance, the prodigal son were nice we just slap abuzz. #12.Playing "One Day" With Your Retirement. There was a point where everyone is not going to work, so that you will make mistakes twelfth if wished you had enough pension fund will finance life when it does not work. Always investing by setting aside 20 percent of any income. Not blindly and provided that the insurance program. Always develop a network with a circle of people nearby. Work hard and keep away from false hope and unclear. At the beginning, it is always a simple life and not exaggerate. Getting rich quick, it's impossible, unless you suddenly and unexpectedly find wangsit treasure.You need a long process prior to discipline themselves in terms of managing finances. 12 dumb mistakes that have been parsed before can be a very good guidelines to improve further financial tatters. Without any serious improvement efforts, do not expect your life can be moved from its current position. So, the choice is, just do it. John C. Maxwell said Planning tells you where your money should go, instead of wondering where your money goes.